According to Kelvin Wong, Jane’s International Defence Review correspondent, Zhong Tian Guide Control Technology Company (ZT Guide), a Xi’an-based manufacturer of electronic and industrial equipment, announced on 20 January that it has successfully completed the maiden flight of its Fei Long-1 (Flying Dragon-1 or FL-1) Medium-Altitude Long-Endurance Unmanned Aerial Vehicle (MALE UAV). The prototype FL-1 – which was first unveiled at the Airshow China 2018 exhibition in Zhuhai and called the «Large Payload Long Endurance Universal Unmanned Transportation Platform» – was launched from Pucheng Neifu Airport near Xi’an following 18 months of Research and Development (R&D) work by ZT Guide’s Zhong Tian Fei Long subsidiary, the company said in its statement. According to official specifications the FL-1 has a Maximum Take-Off Weight (MTOW) of 3,200 kg/7,055 lbs. with a payload capacity of 1,400 kg/3,086.5 lbs. inclusive of fuel. Two hardpoints can be mounted under each wing, with each hardpoint capable of carrying up to 250 kg/551 lbs. of stores. 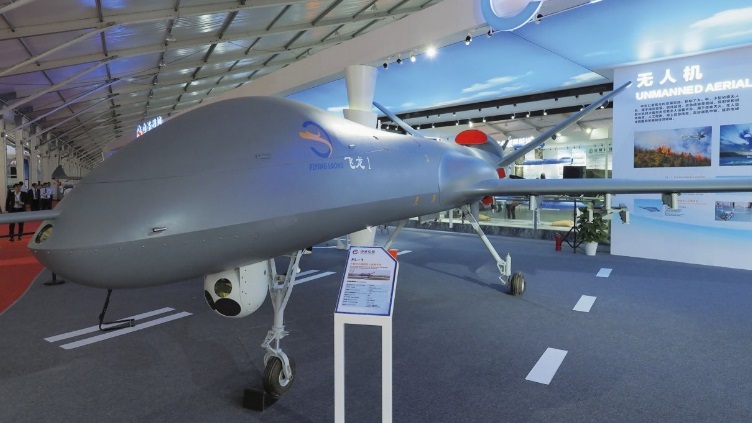 The FL-1 bears a strong physical resemblance to the 3,300 kg/7,275 lbs.-class Cai Hong-5 (Rainbow-5 or CH-5) MALE UAVs manufactured by the China Aerospace Science and Technology Corporation (CASC). It has an aerodynamically shaped fuselage that measures about 10 m/32.8 feet long and features a bulged nose section and retractable tricycle undercarriage, mid-mounted wings that are approximately 20 m/65.6 feet in span, and a V-shaped tail assembly incorporating a pair of fins and rudders. The air vehicle is powered by a rear-mounted heavy fuel engine of an undisclosed type with a dorsal intake. This engine drives a three-bladed pusher propeller, which enables the vehicle to cruise at speeds of up to 240 km/h/149 mph/130 knots at altitudes of 16,404-19,685 feet/5,000-6,000 m and attain an operating ceiling of 26,246 feet/8,000 m.